There are tons of important files stored on your Android phone or Android tablet, which mean a lot for you. It may annoy you so much if you lose these files on your device suddenly. For example, you may mistakenly delete the photos, contacts, text messages when you clean up your phone memory, and it seems difficult to find a good method to recover these lost files in a simple way. Fortunately, a third-party Android data recovery tool could help! 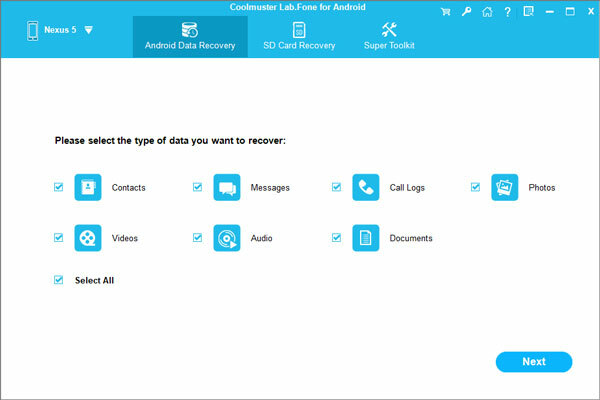 Coolmuster Android Data Recovery software can help you to safeguard your phone. It performs an easy recovery way when your phone or tablet data gets lost. It can assist you to recover not only photos and videos, but also SMS text messages, contacts, call history and more from Android phone or tablet. Android Data Recovery works well with overall Android brands, such as Samsung, HTC, LG, Sony, Motorola, Google Nexus, ZTE, Lenovo and so on. Please choose the right version of the program to download for a free try. 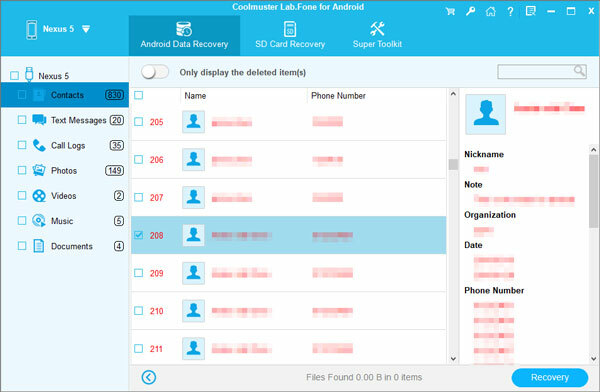 How to Recover Deleted Data on Android Phones/Tablet? Install the program on your computer after you downloaded it. Run it and you will be asked to connect your Android device to the computer via USB. Make sure you have enabled the USB debugging on the phone. Soon this software will detect the connected Android phone or tablet. As you can see, all Android data types are displayed on the left sidebar, including Contacts, Message, Call Logs, Photos and so on. Just check and mark those you want to recover. At the last step, check if you have selected all that you want. If so, you can click the "Recover" button from the top menu to save them to your computer.